In the last workshop in August, AUS students and alumni made 6 biochar stoves out of 55 gallon drums. They used himalayan blackberry and reed canary grass as feedstocks and made some biochar that they use dot amend the soil around several of the cherry trees on the farm. 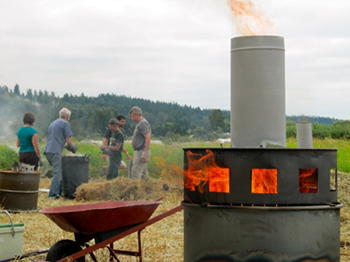 This would be a fun workshop to learn about making and using biochar.